A Fun Run For Hope! I am a mother of 3 boys and my 2 oldest lost their father almost 2 years ago! I have followed your story and worry daily as these boys face pressures daily! You are doing a great thing!! If you ever need help or need a teen to speak I can volunteer my 2 oldest boys! 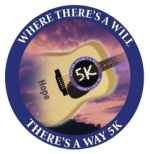 Home / Foundation Events / Where There’s A Will There’s A Way 5k – 2015!